You know how much we love Qualcomm’s Quick Charge 2.0 technology, right? Using a Turbo Charger on the Moto X (2nd gen), then Nexus 6 and Galaxy S6 and now LG G4, has been game-changing in our eyes. Quickly charging phones, especially ones that can’t seem to figure out how to last through an entire day, is the type of innovation that changes the way you use your phone – in a good way, of course. 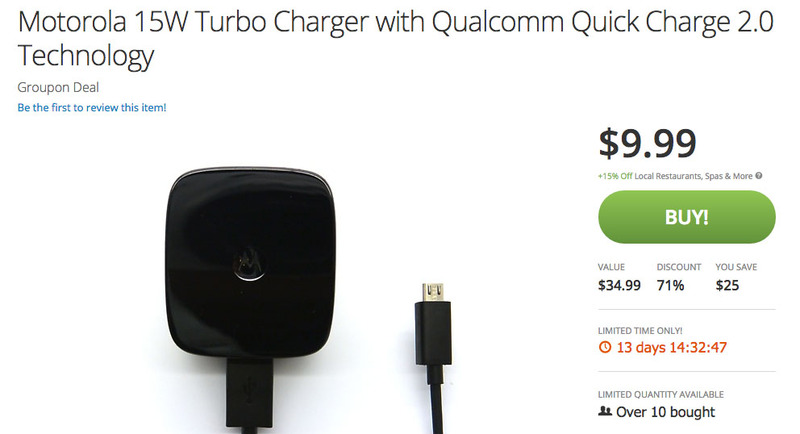 Unfortunately, many of the Quick Charge 2.0 or “Turbo Chargers” made by manufacturers, like Motorola, are never cheap. They charge a premium for this little guys. The 3rd party, random brands, offer inexpensive chargers, but I’ve always felt that you never know exactly what you are getting yourself into with those and tend to stick with those made by the big dogs. And that brings us to today’s deal on Groupon. The Motorola Turbo Charger can be had for $9.99! This tank typically runs $35, so we are talking a 70% discount on an official, brand new Motorola Turbo Charger. You know what to do.